This large 352-page paperback reminded me instantly of an earlier book called Graphic: Inside the Sketchbooks of the World's Great Graphic Designers. It's also not a coincident that the author is the same Steven Heller. 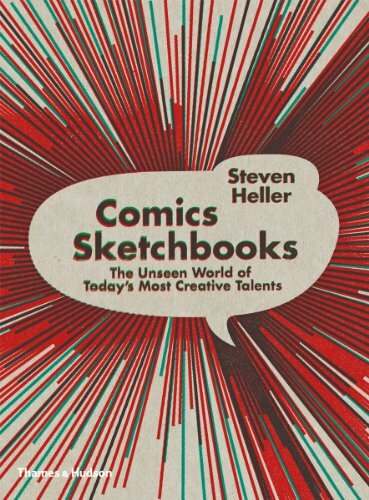 Comics Sketchbooks features the sketchbook pages of 82 artists. There are comic artists like Jim Steranko, animator Bill Plympton, illustrator Peter de Seve, political cartoonist Ann Telnaes, underground comic artist Robert Crumb and more. Those are some of the artists I recognise so it's fun to discover a new bunch of them, each with a short profile provided. A peek at their private sketches reveals the other side of these artists. The sketches show us what they think of and draw while they are unguarded. There are sketches of people on subways, comic ideas, doodles, some literally from dreams and a lot of other weird things. The sketches are rough, some are unfinished, and they all represent some random thought. The artists' hands are like mind seismographs. The artists' websites are included at the back of the book. It's a nice visual book for the adventurous reader to dive into.